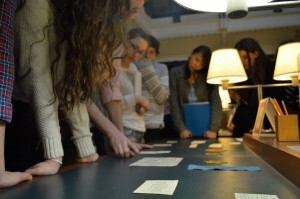 Miriam Merzbacher (c) and students in the reading room at the Center for Jewish History. 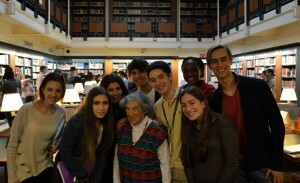 April 4, 2014—The students from Columbia Grammar and Preparatory School quietly filed into the Center for Jewish History’s Lillian Goldman Reading Room past tables full of artifacts from the Theresienstadt Ghetto. Identification cards, meal tickets, a map, Ghetto currency, deportation orders, and other items from the LBI Archives testified to extreme hardship but also rare, fleeting glimmers of hope—a Ketubah in plain Hebrew script documents a marriage that was celebrated in the Ghetto in 1943. These students, upper middle schoolers through high school seniors, came to do research for an upcoming documentary theater project on Theresienstadt, but the faded documents on the tables were not the main attraction. 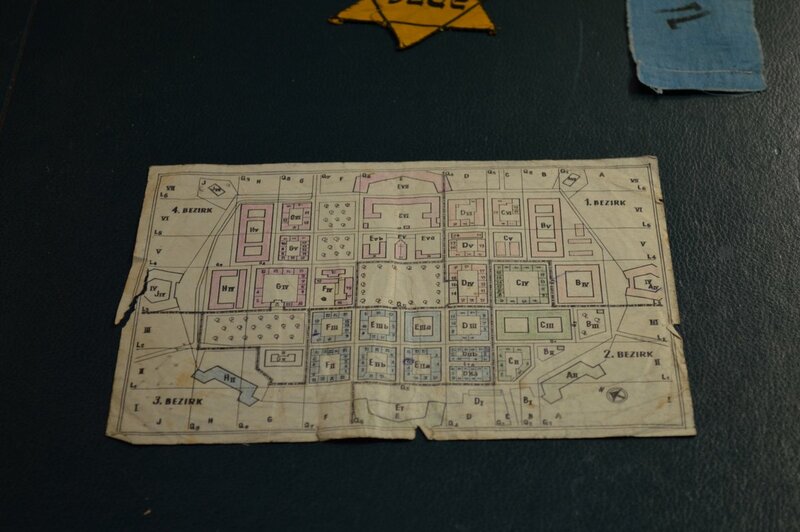 Miriam Merzbacher, a Berlin native who was interned in Hitler’s “model ghetto” from September 1944 until the end of the war, had agreed to speak with them about her experiences. Merzbacher fled Germany for the Netherlands with her family in 1937, but they were interned in the Westerbork transit camp after the German invasion. She was 17 years old when she and her parents were deported from Westerbork to the Theresienstadt Ghetto in September of 1944. Her father was later deported to Auschwitz and died, while her brother was murdered at Mauthausen in October 1941. 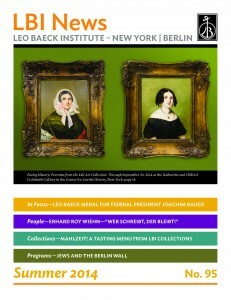 Merzbacher and her mother survived and later came to New York, where her mother became an archivist at Leo Baeck Institute. While the experience of meeting a survivor was new to many of the students, they were already well-versed in Holocaust history. In a recent unit on Theresienstadt, they had read works about the lives of children in the ghetto, including The Girls of Room 28 by Hannelore Brenner and Paul Wilson’s We Are Children Just the Same: Vedem, the Secret Magazine by the Boys of Terezín. “The students have been making connections on their own, but hearing from someone who lived through this makes the connections stronger,” said theater teacher Sarah Cusick. She helped them write and stage a play based on the lives of actual individuals who lived in Theresienstadt. 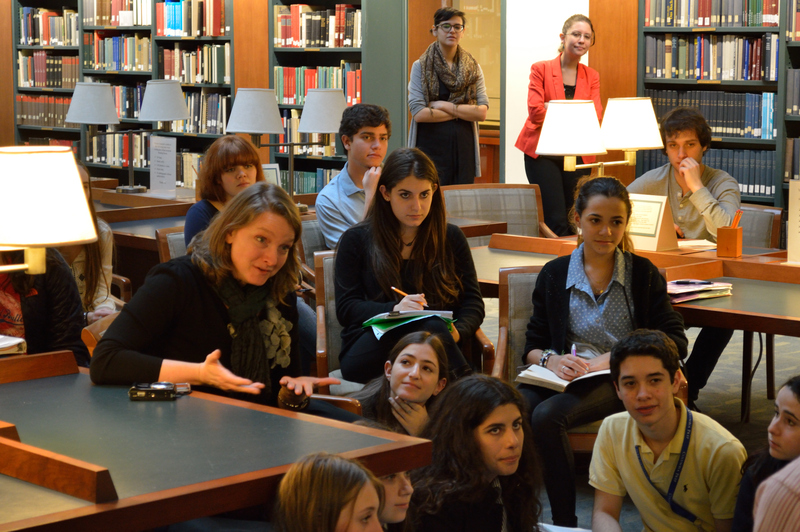 Thanks to their research, the students had insightful questions about Merzbacher’s time in Theresienstadt and its effect on her faith and identity as a Jew. She explained that, to the dismay of her father, at one point in her youth she had wanted to convert to Christianity. However, after the war, a chance meeting with an Israeli soldier in Holland who greeted her with the word “Shalom” changed that. Her only wish now was that her father could have witnessed that moment. She said she misses her father constantly and wishes that he could see her living and identifying as a Jew. Theater teacher Sarah Cusick of Columbia Grammar and Preparatory school (l) asks a question of Miriam Merzbacher. Merzbacher also described one of her jobs in Theresienstadt, discarding the ashes of deceased prisoners into the Eger River. In her words: “It was an unforgettable experience, being told to rush and at the same time holding the ashes of my grandmother’s brother. I felt ageless.” Ian Phelan, an actor and head-editor of the script, said he planned to incorporate a scene into the play based on the dumping of the urns. Phelan added that Merzbacher’s account of feeling “ageless” also left an impression on him. “We have heard this idea from our research before, the idea that no one in Theresienstadt understood what age they were,” said Phelan. According to Cusick, Merzbacher’s testimony resonated with the students especially because in the context of her narrative, she was their peer. “This opportunity to speak to someone who survived Theresienstadt as a teenager is invaluable to my students,” said Cusick. 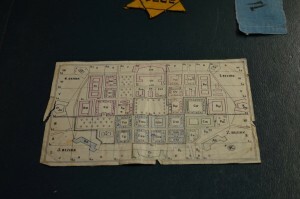 An LBI Archivist explains the origin and significance of artifacts from the Theresienstadt Ghetto from LBI collections.